Good product does the job! Unfortunately my Motorhome (Chausson) had a very non standard original (unavailable anywhere - as subsequently confirmed by two Chausson dealers) unidentifiable battery. A local mobile caravan/motorhome service engineer un knowingly advised me to get the above from you and of course I subsequently found out yours did not fit! Your battery arrived in 24 hours & you immediately agreed to take it back then re above when I found I had no alternative but to modify the M/H battery housing I rang the next day to cancel the collection. Sorry about all that but your staff could not have been more helpful -excellent service & I know where to come next time - I also know it wil nowl fit too next time! Good service, arrived as promised on time. Very well packed. Replaced two old Exide leisure batteries in Hymer motor home. Good competitive price. I ordered by phone and got top class help there. Delivery was extra fast and the battery was very well packed. I will have hesitation in recommending Tanya and ordering again. 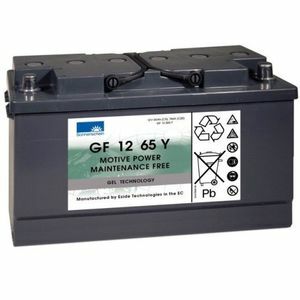 Good quality batteries at excellent prices. Very prompt efficient service. The battery itself is very neat and easy to keep clean, no ridges or ledges to gather dust, or other. Will definitely recommend both company TAYNA and battery. Thank you, it is in our lovely German caravan. Fitted To: Hunter Horizon 30 30 foot yatch! Formidable ,bravo, vous êtes des bons!!!!!!!!!!!!!! Merci! !